AVIATION (French) magazine, November December 2013 issue, cover story, pages 8 - 12, cover story by Richard Saint-George. "The takeoff was impressively brief, indeed we were flying also as soon as we started to roll. ..visibility is every phase of flight really is excellent. "I decided to hold the aircraft in a stall, and with the stick on the back stop it simply sank straight ahead in a very stable condition with a vertical speed of less than 500 fpm. You could ride it down to the ground like this, and although you might burst the tires you would definitely walk away. This is a very safe airplane." 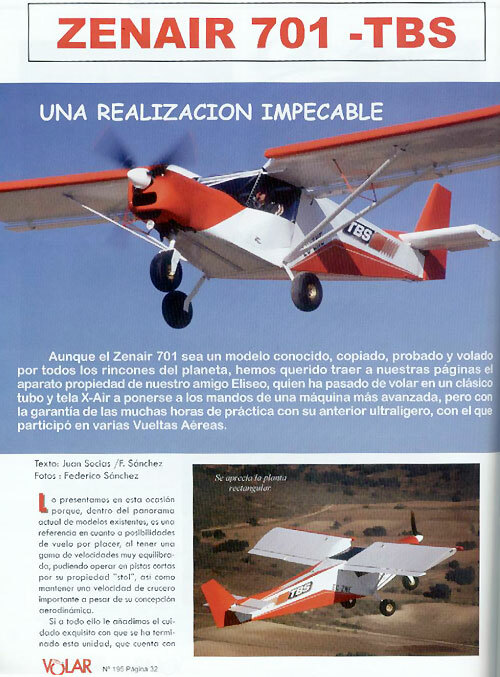 The Aviation Consumer magazine, June 2011 issue: "CH 750: Super STOL LSA" Report by Paul Bertorelli on the STOL CH 750 S-LSA, pages 15 - 27: "Slow speed handling is superb and stalls are nothing but a docile parachute mode... Landings are a showoff's delight." 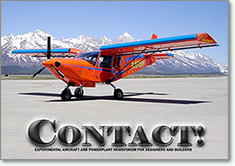 KITPLANES magazine, April 2011 issue: "Building on a Budget" Feature story by Scott Spangler, pages 17 - 23, about Wayne Clagg's scratch-built STOL CH 701: "Wayne Clagg took on a VW-powered plans-built Zenith with an eye toward getting in the air quickly while not breaking the bank." KITPLANES magazine, March 2011 issue: "Four Zeniths, One Day � A Flying Delight" Cover story and flight review by Marc Cook, pages 37 - 42. "So much about the CH 750 struck me as being just right for the mission. The enlarged cabin is a real boon." 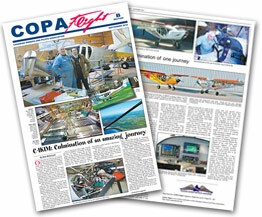 Canadian Owners and Pilots Association (COPA) Flight magazine, September 2010 issue: "Culmination of an Amazing Journey" (cover story, section B, pages 1 - 2), by builder/owner Bob McDonald: "The folks at Zenith Aircraft make a CH750 kit that is an absolute joy to build..." Read the article. 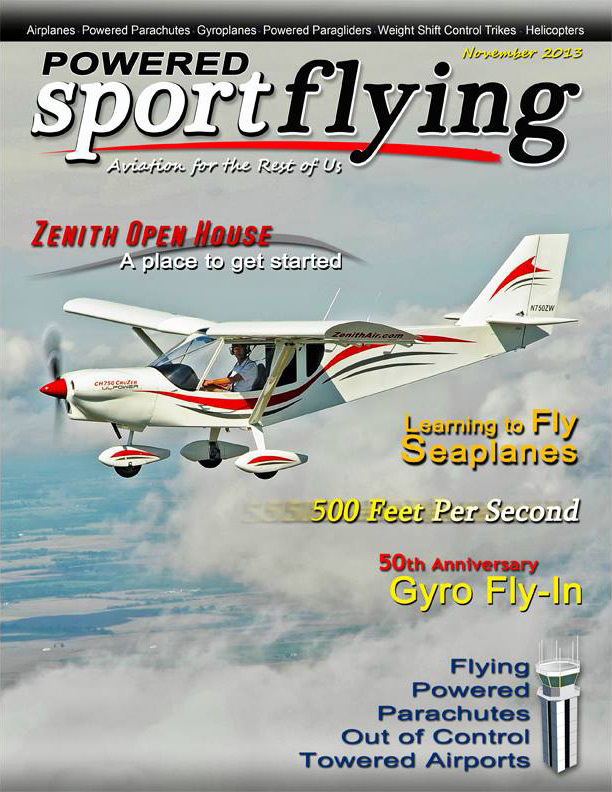 Recreational Flyer magazine, July - August 2010 issue: "Homeward Bound - Bob McDonald's Zenith 750" (pages 7- 9): "With the building part now behind me I have to settle for the thrill of flying my CH750." Read the article. 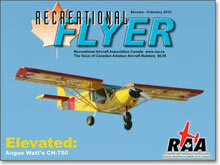 Recreational Flyer magazine, the official publication of the Recreational Aircraft Association of Canada (RAAC), January - February 2010 issue: "Elevated" (cover story, pages 22 - 29): "Chris Heintz saw the need for an updated version [of the STOL CH 701], something with a larger cabin, greater payload, and the ability to us an array of four stroke engines. The CH 750 is the perfect plane for exploring and camping off the beaten path..." Read the article. 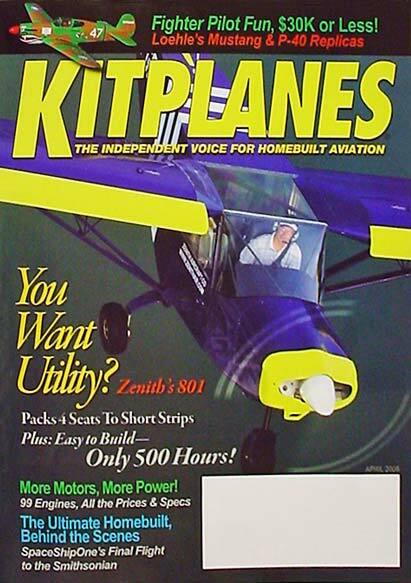 KITPLANES magazine, February 2009 issue, cover: "Zenith's Zinger! The new STOL CH 750 Light Sport: Continental O-200 - Modern, Roomy, Robust - Around $40K!" 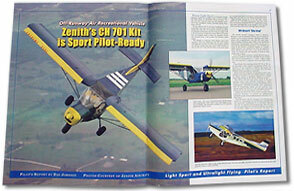 Cover story and flight review by LeRoy Cook, pages 8 - 14. "The Zenith STOL CH 750 is a logically designed evolution of a well-proven design. Given the improved kit production techniques, it should go together in a predictable fashion, even more quickly than the CH 701." 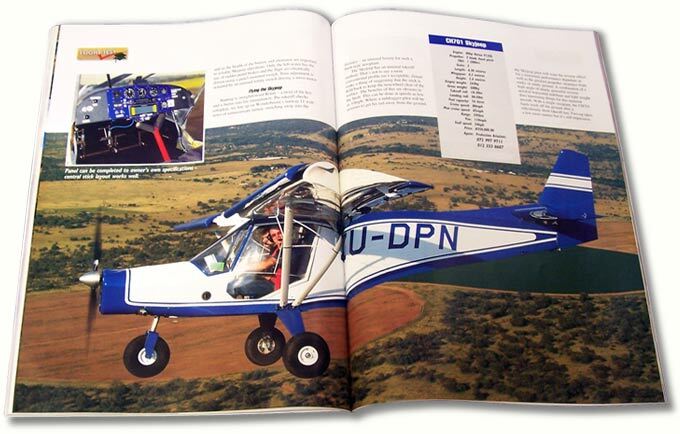 EAA Sport Pilot & Light Sport Aircraft magazine, October 2008 issue, page 29: "The Chris Heintz-designed STOL CH 701 is a workhorse. It has been performing short takeoff and landing (STOL) duty for 20 years and has developed a cult following. Its big brother, the STOL CH 801, is a lot bigger, with twice as many seats and room inside. So, with small and large STOL machines, what else would Chris Heintz fans want? How about a mid-sized S-LSA STOL machine? They have one: the new STOL CH 750." KITPLANES magazine, May 2008 issue. "Unbreaking the Bank... Build and fly one of these eight kitbuilt, Light Sport-legal planes for less than $40,000. Really!" Cover story by Dave Martin, pages 16 - 25. "Excellent STOL performance and low building cost characterize the Zenith Aircraft CH 701. Featuring CNC precut and predrilled aluminum skins, the CH 701 is easy to build quickly. On three occasions, Zenith demonstrated this with kit startup, completion, and first flights in seven days using volunteers at the Florida Sun'n Fun fly-ins." Minnesota Flyer magazine, February 2008. 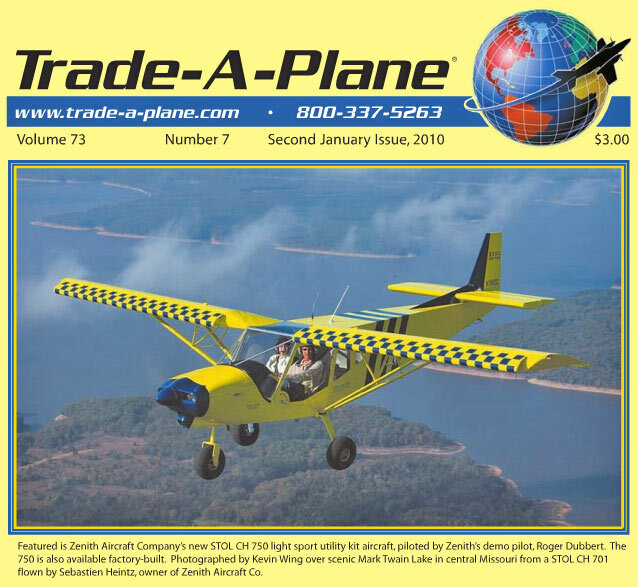 "Start of a Dream... Building my own aircraft," by Terry Croup, pages 10 - 13. Terry reports attending the Zenith factory workshop where he assembled his STOL CH 701 rudder kit: "Folks, the whole process is great fun. With the pride I felt after building just the rudder I simply cannot imagine what a thrill it will be to have the airplane completed and flying. An aircraft built with my own hands." 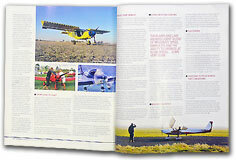 Light Sport and Ultralight Flying magazine, February 2007 issue. "Off-Runway Air Recreational Vehicle: Zenith's CH 701 Kit is Sport-Pilot Ready." Cover story by Dan Johnson, pages 26 - 35. "While no CH 701 will be envied for its striking good looks, the STOL design more than makes up for its workhorse appearance with toughness and outstanding short-field performance. And a 20-year-plus history in the field speaks volumes to the model's market and aerodynamic success." 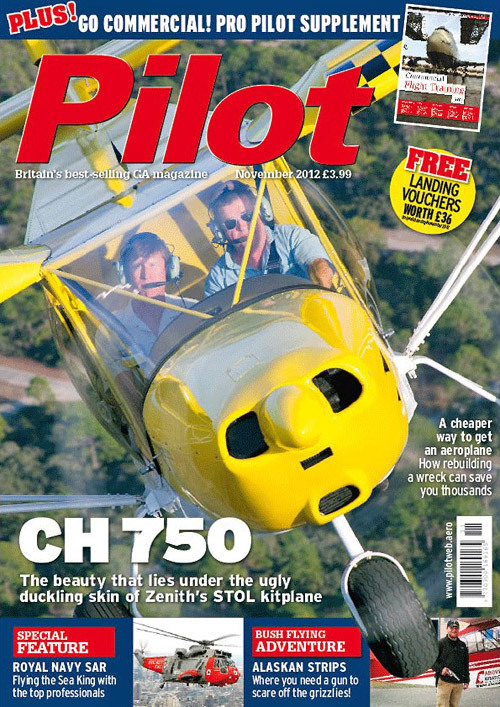 Sport Pilot magazine, May 2007. "The Factory Adventure - Visit before you buy," by Earl C. Downs, pages 52 - 57. "My overall impression of the plant was one of efficiency, cleanliness, and competence... My visit to the factory was worth every bit of what it cost." KITPLANES magazine, October 2006 issue. "Buying Used: All Things Zenith" Cover story by Cory Emberson, pages 18 - 25. "The line of Zenith aircraft has proven to be dependable and straightforward, with considerable factory support." 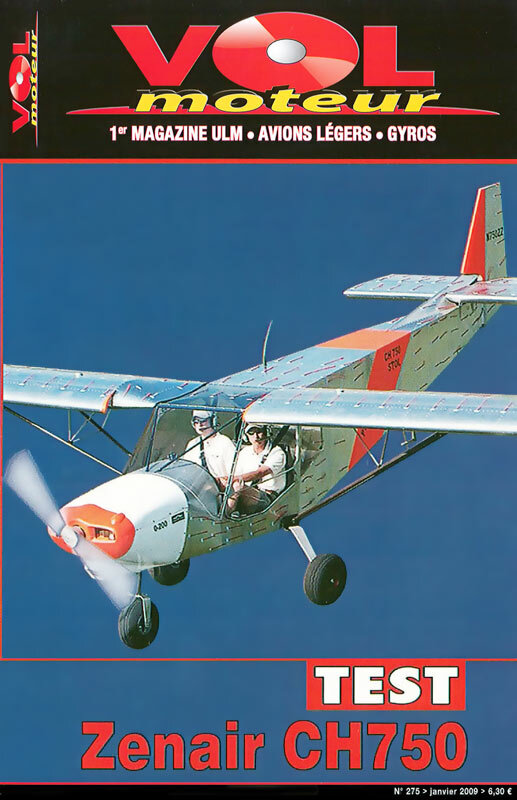 KITPLANES magazine, April 2006 issue. "You Want Utility? Zenith's 801 Packs 4 Seats to Short Strips: Plus Easy to Build - Only 500 Hours! ", cover story by Dave Higdon, pages 20 - 25: "Heintz introduced the 701 almost 20 years ago as a two-place utility design... shocking an industry unaccustomed to the radically cambered airfoil and no-kidding utility appearance," writes Higdon. "Overseas, 701s serve as cargo haulers, crop dusters, spotting planes and missionary-support aircraft. Closer to home, farmers and ranchers use the 701 to patrol property, track cattle or wildlife, and serve in many the same roles as those fulfilled by small helicopters - albeit at a fraction of a chopper's costs." 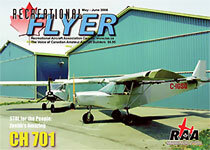 Recreational Flyer (Canada), May/June 2005: "STOL for the people: Zenith's amazing CH 701," cover story by Gary Wolf and Mary Mills, pages 4 - 10. "Chris Heintz designed the CH701 some twenty years ago and it has proven itself all around the world. When the only runway is a cleared patch in the jungle, and the alternative is a week of hiking through snake-infected swamps, the 701 starts to look pretty good. This is a plane that can use almost any clearing as a runway, and its high angle of climb means that you won’t hit the trees at the end of the strip. A football field is plenty enough airstrip for a 701." African Pilot magazine (South Africa), June 2005 issue, pages 53 - 56, by Athol Franz: "Well over 500 STOL CH 701s are already flying on all continents, mostly in off airport environments: Missionary work in Tanzania and Zambia, anti-poaching patrols in Ghana, doctors in northern Thailand, flying training in India. The STOL CH 701 stands as one of the few light planes to serve in the sort of serious utility roles usually reserved for larger airplanes such as the Helio Courier, Piper Super Cub, Maule or Aviat Husky. Its stellar short field capabilities and slow flying characteristics make it ideal for any bush or farm operation: herding, surveying, patrolling and protection services. SA Flyer magazine (South Africa), April 2005 issue cover story. "SkyJeep STOL CH 701" by John Miller. "This aircraft is great fun to fly. The Skyjeep would be an ideal item of equipment for any farmer with substantial acreage. Moreover, the design is very well suited to many aerial work requirements where short field performance and a good view are required." 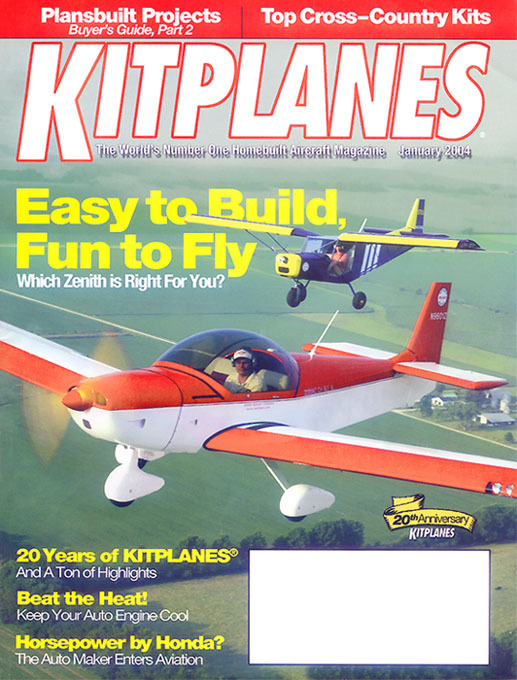 KITPLANES magazine, January 2005 issue. "Chris Heintz has the innovation and forthrightness to achieve success" by Tim Kern. Pages 12 - 19. Designer Spotlight Cover Story. KITPLANES magazine, October 2004 issue. "The Top 20 - Meet the most influential figures who have shaped the homebuilt aviation industry" by Rick Lindstrom. Pages 59 - 63. Designer Chris Heintz profile: “The Zenith philosophy helps customers all the way through flight testing, ensuring that the completed kit will meet expectations and fly safely as well. Zenith’s goal? Happy customers." KITPLANES magazine, January 2004 issue. 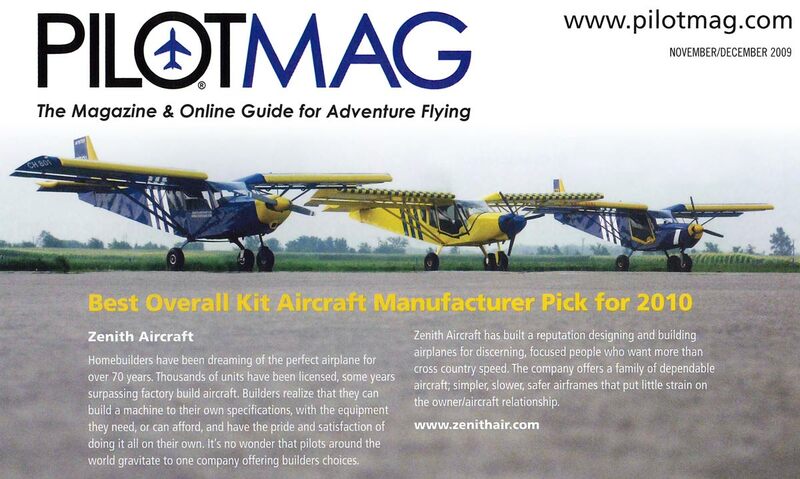 Cover story: "Easy to Build, Fun to Fly: Which Zenith is Right For You?" by Dave Higdon. Pages 8 - 15. Comparison of the ZODIAC XL and the STOL CH 701 designs: "The bottom line: Hands down, both airplanes easily fulfill their respective missions. Best of all, they do so with flying traits that should challenge few pilots of average competence." "Even though it is only handsome in the way of a Hummer, the CH 701 enjoys a good reputation for its durability and outstanding STOL performance." 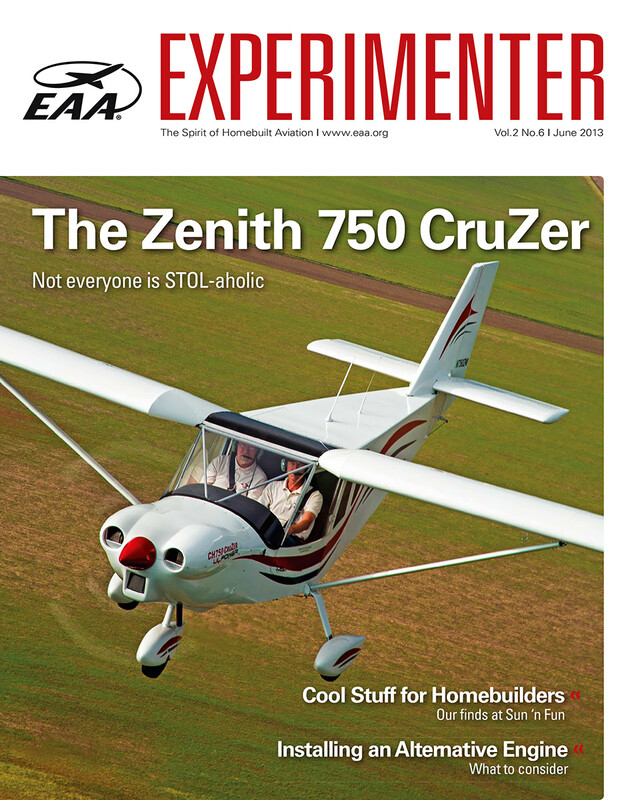 EAA Experimenter magazine, January 2004 issue. Cover story, by Dan Johnson, pages 24 - 29. "...capable of operating from the roughest, shortest strips." "With big tires and lots of lift-enhancing devices, the Zenair CH-701 is a great backwoods aircraft on wheels, floats, or skis as Grant Rappe demonstrates." "Our takeoff roll was absolutely unbelievable. The only two other aircraft that I can think of that possibly could take off shorter would be a helicopter or Wayne Handley's Turbo Raven. With a high nose pitch, the STOL CH 701 literally climbed out with two adults and full fuel at 1,000 feet per minute with about 100 feet of ground roll, breaking ground approaching 30 knots indicated airspeed!" "With its slotted leading edges and a clear sun roof, the CH 701 makes for a good turning "ag plane. It's not really an ag plane, per se. But it sure has a place in an ag operation. I really liked the CH701-AG... affordable to own and operate. Flying over the corn at 100 mph, making 30-second or less safe turns, an exceptional climb rate and short takeoff and landing capability, deems the 701 a viable aircraft for many spraying operations." Bill Lavender, Editor, AgAir Update, October 1999, pages 28 - 30. "To put it simply, aeroplanes just shouldn't do what this one does, dammit! "I went out and measured a short takeoff distance, at an elevation of 2,500 ft, on a 22 degree Celcius day (a density height of 3,700 ft), with only me (at 82 kg), and 40 litres of fuel: the take off run was FOURTEEN METRES with no wind!! "If you ever get the chance to have a fly in one of these aircraft, DO take up the offer! It is simply great fun to fly." Mike Watson, Australian Ultralights, Cover Story, October/November 1998. "The 701 may not be a beautiful airplane, but it is certainly a super STOL with a full gross takeoff roll of 90 feet and a landing roll of 140 feet. The 701 fits with back-country unimproved flight strips and sand bars; and with a pair of Zenair amphibious floats, it will go almost anywhere you'd ever want to go."" KITPLANES, November 1998, "Zenair Builders Speak Out - CH 601 and CH 701 builders/pilots tell their stories," by Don Downie, pages 62 - 67. 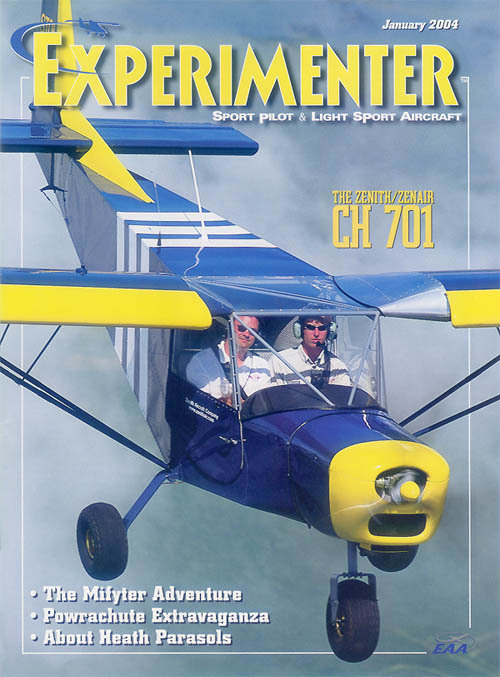 EAA Experimenter magazine, January 2004 cover story, pages 24 - 29. "The two-place STOL CH 701 has been a success story largely unnoticed in the U.S. More than 400 have been completed worldwide but only 100 of them have emerged from homebuilder's shops in the U.S. Usually that ratio would be reversed, but the real world use of the airplane has dictated otherwise. A significant number of those being used in Africa and other under-developed areas of the world rarely or never see a paved runway... or any sort of formal runway, for that matter." "No field is too short, no runway too rough. 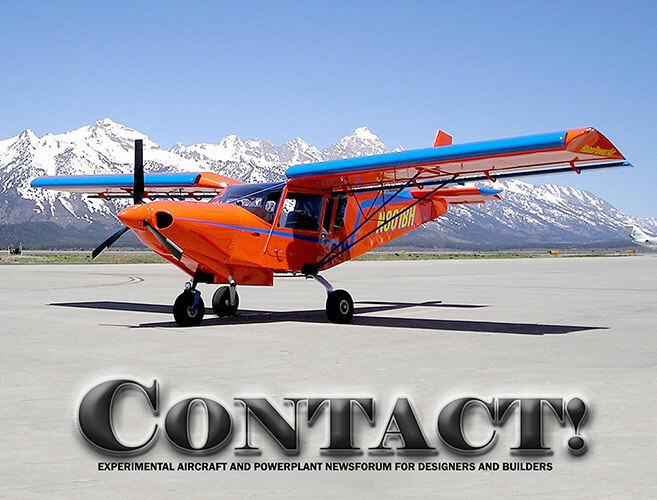 The Zenith STOL CH 701 is a true bush aircraft in ultralight format. "We have flown the two-seater for you and were surprised by the unique flight characteristics of this aircraft. 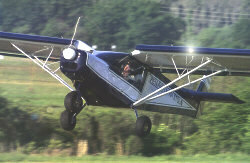 High-lift devices and the Rotax 912 engine make the two-seater a real STOL aircraft. On the other, flying longer distances takes a little bit more time. The light high-wing is the right aircraft for all of those seeking an individual aircraft." 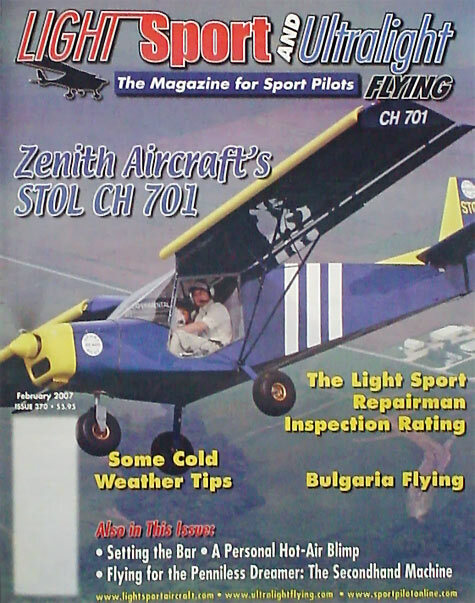 Aerokurier (Germany), December 1998, "STOL CH 701: Form follows function," pages 54 - 58. "...when the aluminum chips settled the scales tipped in favor of the STOL CH 701. Factors that weighed in the decision included its mostly pulled rivet construction (versus driven rivets), simple design, large builders' group, and excellent factory support." "For anyone lucky enough to walk the homebuilt flightline, it was impossible to pass N701PW, Paul Walton's Zenair CH701 STOL, without stopping for a look. The craftsmanship and colorful paint scheme made the airplane a must-see for hundreds of Sun 'n Fun visitors, and a small crowd seemed to be permanently gathered around the airplane. But why all the excitement? Perhaps the owner's enthusiasm about the 701 rubbed off on others. "I can't say enough good things about the airplane's performance," Walton said. "Everything that Chris [Heintz] told me was true." 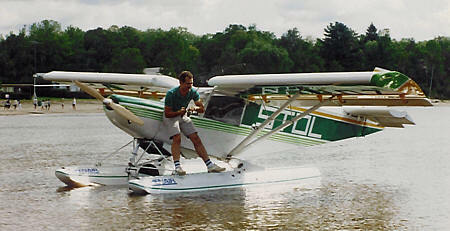 Walton lives in Maine and does much of his flying on water, so he equipped the 701 with amphibious all-aluminum floats. "I've had the airplane for a year, and I love it," he said. "Lakes, streams, ponds, you name it, and the airplane can land there." Part of what attracted so many visitors to Walton's plane was the exterior. On its floats, the airplane is huge. It's painted bright yellow with lightning bolts on the fuselage sides and the top of the wing, and small white clouds surround the bolts. The interior is upholstered with rainbow striped material, providing for a colorful airplane all around. parked at the airport to use on long flights." The 701 is powered by a 100-hp Rotax 912. It won the short field takeoff contest at Sun 'n Fun 2001, and Walton is considering entering the competition again this year." KITPLANES magazine: Sun'n Fun 2002, by Brian Clark. "The fact that a flying airplane can be produced in only one week is a testament to the simplicity and completeness of the design. Chris [Heintz] has been designing aircraft for decades and is a respected and dedicated designer." "...took off in a distance that would have done an ultralight justice, carried out one of the tightest 200 foot circuits I've seen, then proceeded to land in what looked like inches rather than feet. Surprisingly this was without injury or shock to either occupant. In fact, they were both grinning from ear to ear. "...designed for safe slow-speed flight, and to give the low hour pilot a safe, flyable airplane, incorporating all the things we expect to find on more conventional airplanes like tricycle gear with nose-wheel steering. "Access is easy through good sized doors on each side. Hinged forward, the doors are a full 34 inches wide making it easy to swing into the well padded fixed seats. Cabin width is a comfortable 40 inches, somewhat less intimate than some of the competition. "Visibility both forward and above is excellent. Being a tri-gear airplane you can see where you are going even when taxiing." "Hey buddy... wanna land on a postage stamp? If so, we definitely have the bird for you. Zenair has been in the business of designing and building aircraft for some twenty years (something of a record in this business), and it shows in the success of their airplanes. 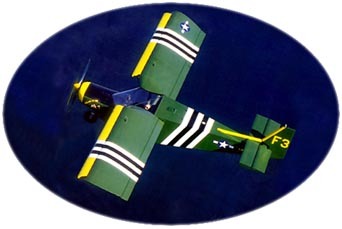 One of the most successful of these designs is the STOL CH 701, a high-wing monoplane with a special airfoil utilizing leading-edge slats and trailing edge "junker" type flaps. This trigear has excellent shock-absorbing ability and big 16-inch wheels for rough-field operations. If youd really like to see what goes into one of these creatures, Zenair sometimes builds one in just seven days during the Sunn Fun fly-in in Lakeland during April. "With gross weight with a Rotax 582, the 701 is off the ground in just 90 feet (really... Ive done it myself), climbs at 1,000 fpm, cruises at 75 mph and hits a top speed of 85 mph. With wing tanks, the range is 450 miles, and it has a service ceiling (get out the oxy tank) of over 16,000 feet. Oh yeah, the bird stalls at a blistering (snicker...) pace of 26 mph. "While the [Rotax] 582 version of the CH 701 flies very well, you really need to check out the Rotax 912 variant... that thing can really sky out! The 912 bird is off the deck in well under 100 feet, cruises at 85 mph and climbs over 1200 fpm. With very responsive controls, super STOL capabilities, rugged construction and a great landing gear, the CH 701 is just the bird for the guy who has to fly out of the roughest boonies. There is no better STOL bird available in the "Affordable Flyer" category today." US Aviator magazine, "Affordable Flyers"
"There is something very pleasant about any object that looks like it behaves. The Zenair STOL CH 701 looks for all the world like a STOL [short takeoff and landing] airplane. From the leading edge slats to the solid landing gear, the airplane just begs to get out into the woods. "Though the airplane is build out of aluminum and rivets, just like a "real" airplane, it will land shorter and takeoff faster than a lot of airplanes advertised as "ultralight trainers." The place where this airplane comes into its own is on a few hundred feet of rough runway, not a few thousand feet of shimmering asphalt. Any unimproved strip you can get an ultralight in and out of is plenty for the Zenair. The advertised takeoff roll is 115 feet, and that is conservative! "It was while watching the STOL CH 701 flying several years ago with the rest of the ragwing-and-wires crowd [at Sun'n Fun] that I truly came to appreciate the design. From my point of observation, there was no two-place airplane that could takeoff shorter, land shorter, climb or approach more steeply, or handle a crosswing better. "When you take one look at the STOL CH 701, you know that there have been a lot of professional decisions made. Quite simply, the airplane doesn't look like a "homebuilt" at all, but rather it looks like a production airplane. This is because designer Chris Heintz came from a very sophisticated background that centered around engineering for production aircraft. Because he was trained as an engineer and not a mechanic, his first "homebuilt" design incorporated very simple construction methods throughout - a concept that he has maintained in his subsequent designs. "What all this translates into is a well designed aircraft with excellent handling qualities that is easy to build. The airplane delivers on every promise and is truly an outstanding design. "...the cabin is very comfortable and well appointed. The rudder, ailerons and flaperons are very light and mechanically balanced. They feel smooth as silk. 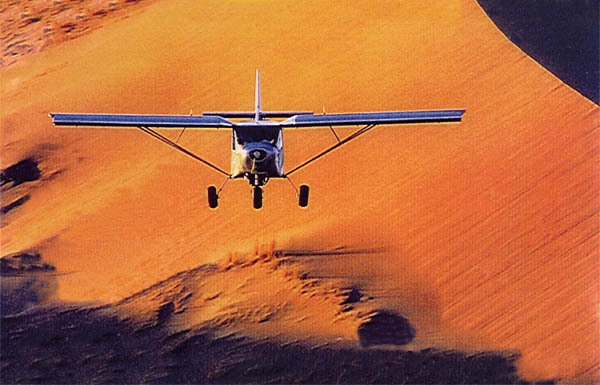 "Takeoff in the STOL CH 701 is breathtaking. Depending upon how aggressive the pilot wants to be, the airplane can be hauled into the air with a ground roll of less than 100 feet. ...the control response was very good, and because of the low stall speed, it is possible to make the airplane literally pivot on a wing tip. I've seen airplanes that could be flown through a hangar, but as I have said before, I think a really good pilot could fly a STOL CH 701 into a hangar, do a 180, and fly back out. The performance is truly that spectacular. "Construction is simple and straight forward. Zenair also provides excellent technical support. There is also a bi-monthly newsletter which provides a link between the designer and the builder. "Far from Chris Heintz' first design, the STOL CH 701 is the latest in a long line of successful sport aircraft. "Like the airplane itself, the Zenair information packet is well thought out and complete." "My latest escapade in Mexico, Missouri, was in the CH 701, the Chris Heintz version of a helicopter. My introduction to this fine design, first flown in 1986, turned out to be one of the real surprises of my flying career. "One of Heintz trademarks is that his kits are simple to build, requiring just average skills and inexpensive tools... kit prices are not exceptionally higher than what a builder would pay for the raw materials, simply because of the ease of making them. On a production line, Zenith parts can be made faster and more accurately than even the fastest, most skillful homebuilder could build them. "I attended one of Zeniths builder workshops recently and discovered that all a builder needs is a table, hand snips, drill, straightedge, pencil, file, and rivet puller to build the entire airplane. No need here to spend $2,000 on big tools that take up valuable shop space and make far too much noise. "All of Zenairs kits are quick to complete by anyones standards. Owners have reported times as low as 350 hours, with 400 a conservative average. That is just 20 hours a week for 20 weeks. "We soon taxied out for the show. The nosewheel is steerable and the toe brakes do a good job. You start take-off with the stick back, and at around 25 mph the wing lets you know in no uncertain terms that it is working. Ease up on the stick to get the wings down from the stall angle, and youre off. Climbouts are at 45 mph, giving you a nose-up attitude of the space shuttle variety. Climbing to altitude, we leveled off, which brings the top of the cowling right to the horizon. We executed some extremely tight turns, and you can look up and over the wing to see precisely where you are flying. "The controls are a true delight. I had expected some slow, maybe sloppy results, but the balance is exquisite and the movement smooth and silky. I actually have to compare it somewhat to the feel of the stick in a LoPresti SwiftFury - and thats no joke. The airplane will turn on a dime. Throttle input is instantaneous. "Even in near-calm conditions, we were getting the airplane off the ground in less than 150 feet and landing it just as quickly. "I would love to have more time in the 701. I would even like a shot at building a 701. I know that the rudder I helped with at the workshop was a piece of cake. "The 701 turned out to be a pleasant surprise, but Im just one guy. You can find out for yourself at the Zenith factory in Mexico, Missouri. "And how about this: The CH 701 was recently certified in Israel. To date, the company has sold more than 600 kits worldwide, over 400 of which are flying." Jim Cavanaugh, General Aviation News & Flyer, April 1994. 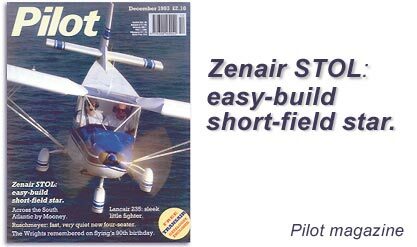 "The Zenair STOL CH 701 also makes an excellent primary trainer. The 701 has short takeoff and landing capabilities adding to the safety of the aircraft as a trainer." STOL CH 701: "A true sport flying classic"
"it possesses the uncompromising air of the seriously practical machine it is." "Startingly short take off runs and hard-to-believe slow speed capabilities"
"mind-boggling slow speed flying capability..."
"Whereas taildraggers can be hard to handle in a crosswind or just plain hard to handle for some pilots, the tricycle gear of the STOL CH 701 is nearly foolproof. And because its set so wide, youd be hard pressed to make anything but decent landings." "For ten years the Zenair CH 701 has been a favorite of homebuilders around the globe. 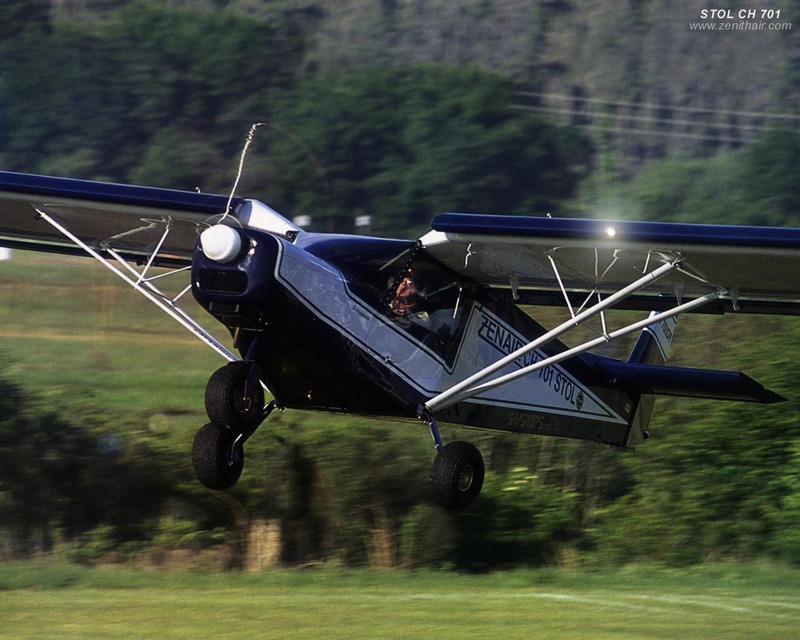 Affordable, easy to fly and to build, the STOL CH 701 is a tough act to top. Doubtless, the reason for the kits success can be summed up in one word: value. With the STOL CH 701, you get a good flying airplane at a great price. What more could you ask for?" "Zenairs STOL CH 701 continues to gain recognition around the world as a low-cost light-utility aircraft. Nicknamed the "Sky Jeep" by African missionaries, the popular kit aircraft is earning its keep by transporting personnel and medical supplies to remote African villages."